Paediatric Neurology is a specialized branch of medicine that deals with the diagnosis and the treatment of the complex neurological disorders in the newborns, children and adolescents. 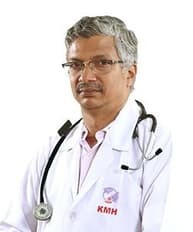 Dr.Kamakshi Memorial provides inpatient consultation and outpatient care to children who are referred by their paediatrician or by another specialist to us with a range of childhood neurological disorders. We offer strong multi-disciplinary approach, with the team consisting of consultants, physiotherapists, occupational therapists, nurse specialists, speech and language therapists, pharmacist and dietitians. Parents are advised to close watch on children and seek immediate help, if they found any unusual sign or symptoms/ delay in growth/ behavioural problems and for neurological problems in children. We also provide rehabilitation and psychological care training for the parents in taking care of their children in managing stress, abnormal reaction to illness in order to ensure best possible outcome. Our work is supported by colleagues in occupational therapy, physiotherapy and speech therapy.